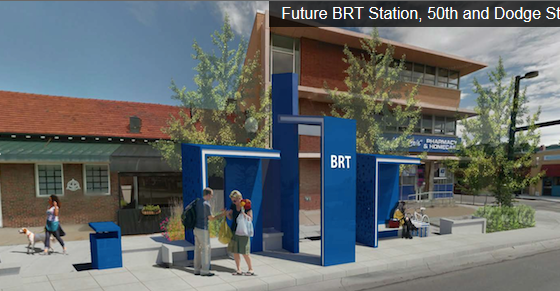 An article in the Friday, August 14 edition of the Omaha World Herald, “Why are the BRT stations so expensive? Officials explain the $260,000 price tag,“ describes a new $30 million bus rapid transit plan for Dodge Street with 27 individual sleek, modern bus stop shelters along the route at a cost of $260,000 each. Half of the new $30 million plan will be paid for by the city of Omaha and half by the Federal Transit Authority which has an annual budget of $8.6 billion. The issue is not whether Omaha should spend $15 million in local funds to achieve a $30 million bus system upgrade. We can expect city officials to make a responsible decision on this matter. The real issue is why the FTA should have annual budget of $8.6 billion to begin with when it is paying for, and therefore encouraging, extravagantly designed bus transit systems all over the country. The U.S. deficit for the 2015-2016 budget year, ending on September 30, is predicted to be about $450 billion dollars. This adds to the approximately $13 trillion public debt (on which we pay interest) which, at 74% of GDP, is the highest it has been since the end of WWII (see the above chart from the Congressional Budget Office). It is the responsibility of Congress and the President to figure out how to get the budget under better control. All aspects of federal spending can and should be tightened up, including entitlements (Social Security, Medicare and Medicaid) and discretionary spending (everything else). The Federal Transit Administration is wasting money on unnecessarily extravagant bus transit systems. Such fiscal irresponsibility means that its budget should be cut significantly. Many other similar examples exist in the federal government. We need people in Congress who can identify these fiscal boondoggles and effectively agitate for needed cutbacks. This entry was posted in debt, deficit, fiscal irresponsibility, fiscal responsibility, Jack Heidel, Omaha World Herald and tagged bus rapid transit, cutting spending, deficit, Deficit spending, fiscal responsibility, jack heidel, Omaha World Herald by jackheidel. Bookmark the permalink.